You ladies seem to be loving the tv- and movie-inspired decor posts... so I'm going to keep them coming! 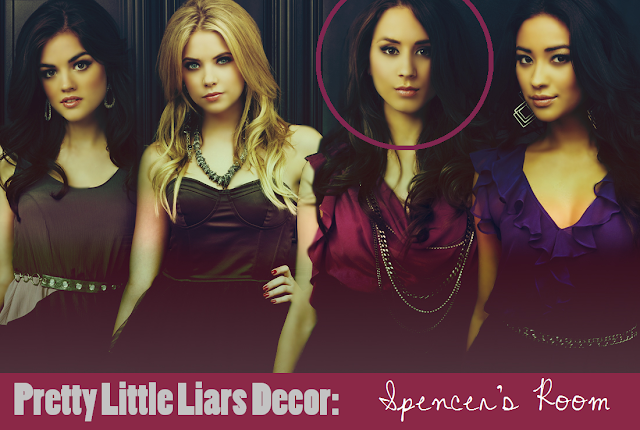 By reader request, I've been working on a series of decor posts inspired by the bedrooms on Pretty Little Liars. Today, I'm starting with Spencer. Since Spencer Hastings is the wealthy, competitive, intelligent, overachiever of the group... how could I not choose two big words to describe her style: Provincial Contemporary. Her space combines the antique patterns and provincial furniture of French cottage style with the abstract art and modern furniture of contemporary taste. For starters, her bed is dressed-to-the-nines in provincial style. Her creamy toile duvet is oh-so-French-country. So are the floral and toile pillows. Mixing up the color scheme between cream-and-navy and cream-and-red brings an eclecticism to the pastoral vibe to keep it from getting too prim and proper. The art on the wall, being abstract and rough in texture, contrasts with the richly-illustrated toil. Spencer's bed is a clean-lined, sleek take on the traditional four-poster canopy bed. Sheer white curtains soften the stark edges. The wallpaper in the room is a busy vintage floral, but ends up looking pretty subdued due to its subtle neutral tones of pale taupe, sage green, and ivory. The lamps combine two different styles just like her room does: the bold red base reflecting contemporary taste, while the lampshade is a fresh, updated take on vintage. The bedside tables maintain modern lines, while the mirror surface and shining hardware add a hint of glamor to the space. A black vintage-inspired alarm clock, floral-patterned box, and color-coordinating picture frames accessorize the nightstands. This corner of Spencer's room leans more toward the modern spectrum of her eclectic look, but it has tradition at its roots. For instance, the red leather chaise-lounge is undeniably 21st century... but its structure is the descendent of the centuries old fainting couch that appeared heavily in Victorian times. The chrome side table is sleek and shiny, but its silhouette is antique for sure. To put it nicely, Spencer's desk area errs on the side of creative chaos. Her priorities are all in full view, and kept a little neater---you can spot her textbooks stacked on the bookshelf and trophies in a line up high. This space also shows off her artistic side. A huge fabric-covered inspiration board is jam-packed with paint swatches, magazine clippings, and wallpaper samples. (Does our Spencer have a future in interior design?!) All the furniture in the workspace is clean, sharp, and modern. I think Spencer likes to keep two things within sight: her accomplishments and her inspirations. 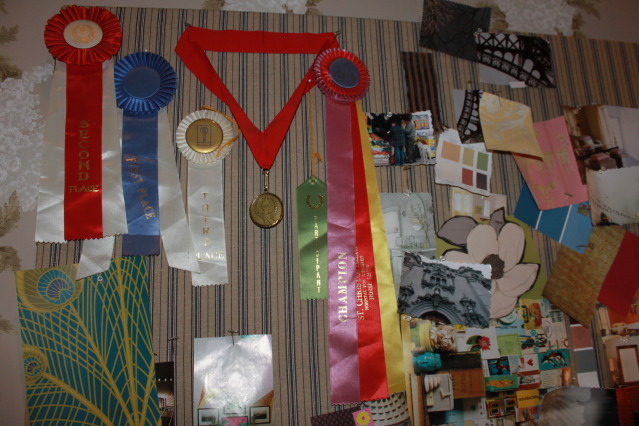 Here we have some of her awards and ribbons, plus a whole bunch of magazine scraps, paper samples, and fabric scraps. 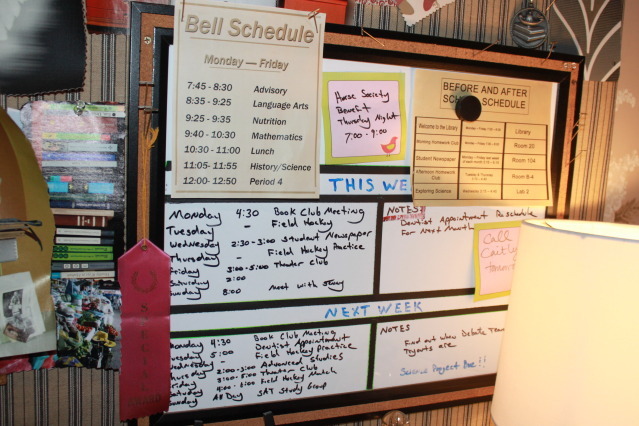 Despite the inspiring chaos around it, Spencer keeps school stuff uber-organized on a whiteboard. A peek at her artsy side. 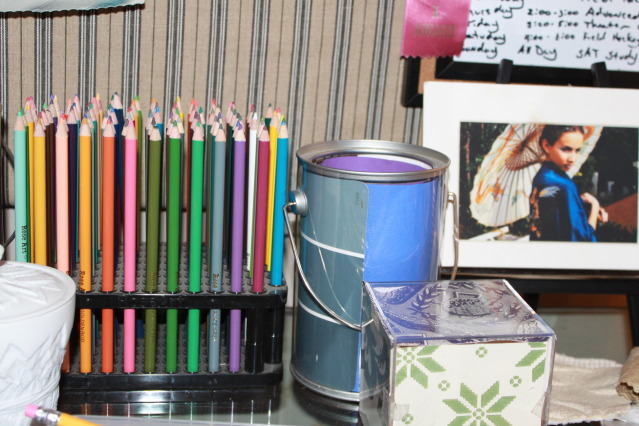 Lots of color pencils---perfectly stored and perfectly sharpened. I reeeeally love the paint can with the paint swatch inside of it. And the photo cube displaying patterned paper instead of photographs---great diy idea, Spence! 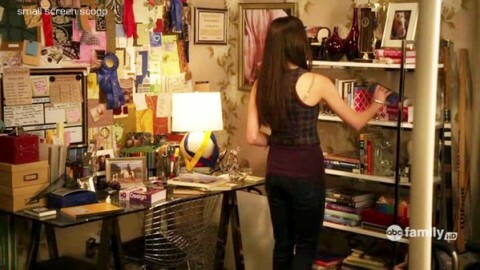 Spencer pushes all of her personal and sentimental objects into the desk area of her room. 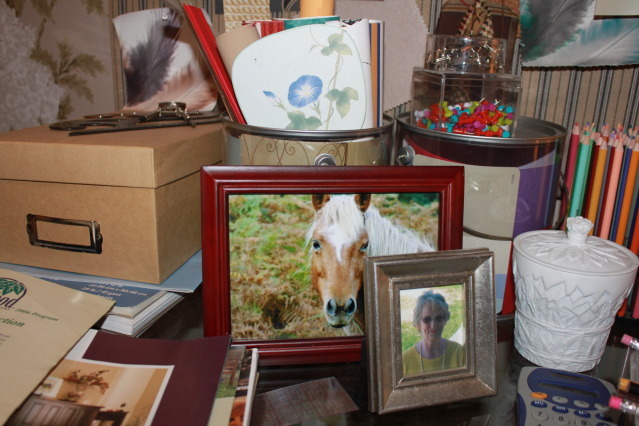 Here we have photographs and knickknacks surely close to her heart. Alright! Time for the fun part. 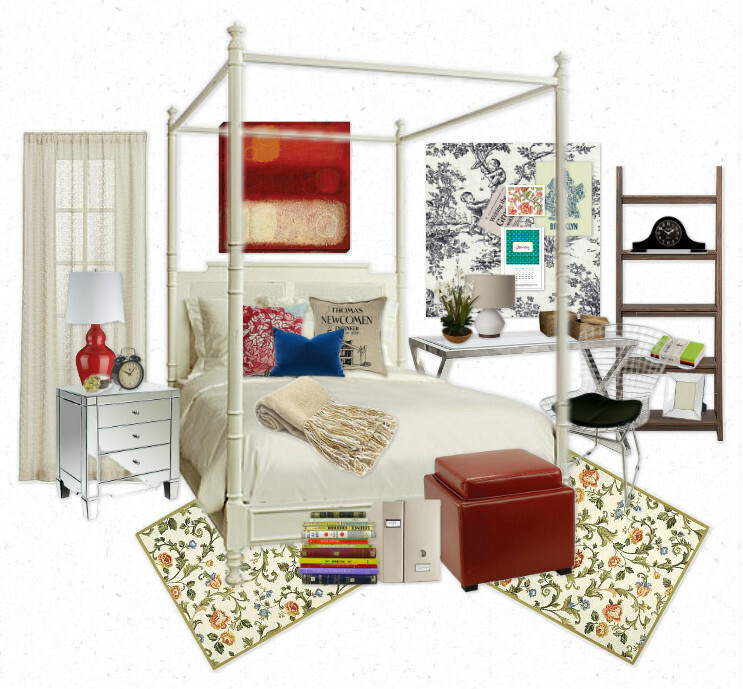 Here's my guide on working Spencer's contemporary-meets-antique style into your dorm or apartment. Bed: The focal point of Spencer's room is her four-poster canopy bed. So if you can at all get your hands on one, do! Check out antique stores, thrift shops, and garage sales first. (I used to have a vintage cream four-poster I found on Craigslist...) Be open-minded. You might find a wooden one that can be painted white. You might find a plain four-poster rather than a canopy. Maybe your dad knows how to build one. If you live in a dorm and have a loft, consider turning your loft into a canopy bed by following the instructions of this furniture hack. As a last (more spendy) resort, shop online. Hang sheer white curtains on the canopy bed and on the windows. Mirror Finish: Mirror-finish furniture can be expensive. For a while, Target was selling small mirror nightstands at a decent price. But if you want the luxurious mirror look of Spencer's bedside tables without having to spend a fortune, you have a few diy options. Spraypaint a plain nightstand with mirror spraypaint (like Looking Glass by Krylon). Glue small, unframed mirrors (available at hobby and party stores) to the trim of a white nighstand. Or simply set a plain piece of unframed mirror on top of the nightstand for a mirror finish top. You could also integrate mirror accessories (or just lots of mirrors) throughout the room to get a similarly inspired look. 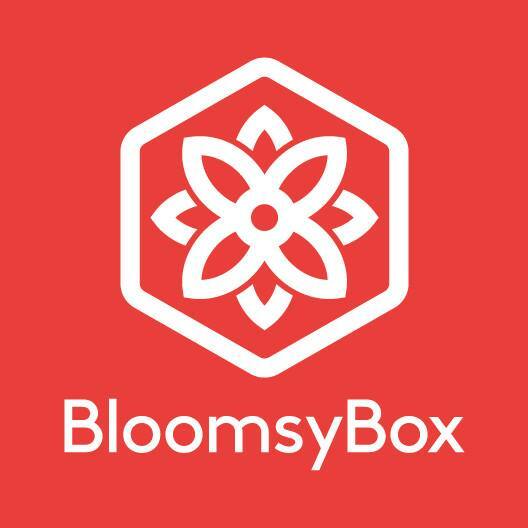 Florals: Since you're probably not allowed to apply wallpaper (thanks to landlords and dorm directors), try to integrate an antique floral pattern elsewhere in the room. A big rug featuring vintage flowers would be great. Other ideas would be large pieces of art, floral patterned paper, or draperies. Desk: As far as the desk and bed go, strive for clean, modern lines. Nothing too fussy. Use a chair that features shiny metal if you can. The simpler you keep the furniture in this area of the room, the more you'll be able to bombard it with your personality and creative chaos like Spencer did. Toile: Toile can be difficult to find, especially as a comforter, but the bigger problem is that if not done correctly... too much toile equals granny style rather than French cottage style. So instead of risking overwhelming a small dorm or apartment with too much lovely toile, I dispersed it throughout the room. One good option is to cover your big inspiration board with toile fabric. A toile throw pillow is a good option. Or even small accessories such as a journal or lamp shade would word. A little toile goes a long way. Chaise: While I wish we could all fit a modern, red leather chaise lounge or couch into our dorms... that's simply not the case. I could have plopped one into my decor board for fantasy's sake, but I decided to share an alternative instead. You can get the same look and vibe in a smaller package by giving up the chaise for a red leather ottoman. 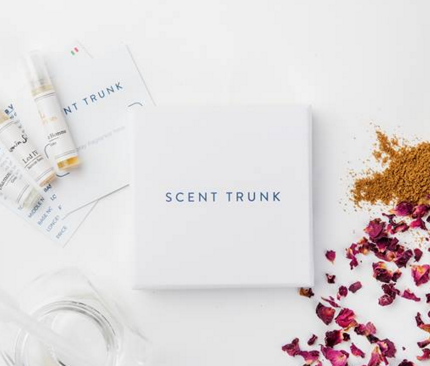 Plus, it offers storage. Etc. : Hang a big piece of abstract art over your bed. Don't go out and buy this, ladies! Take a good hard look at Spencer's art. It's a square canvas (or piece of wood) with stripes painted across it. Hit your local craft store---the supplies will cost you less than $10 and set you back about 30 minutes. Vintage-style alarm clocks are always around; you can find 'em at an antique store or even Target. For lamps, focus on a contemporary base. Don't spend too much for a red one when you can simply paint one red. A basic white lamp shade will do fine. Accessorize the room with picture frames, neatly stacked books, your craft/art supplies, and all of your awards and trophies. 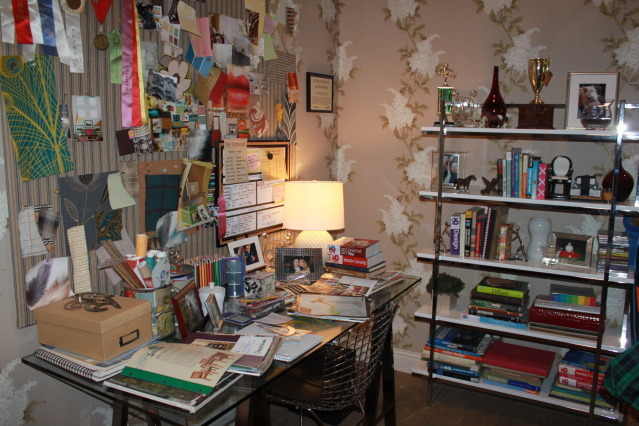 So tell me... could you see yourself living in Spencer's room? Or are you more like one of the other Pretty Little Liars? Come back tomorrow for another PLL room! 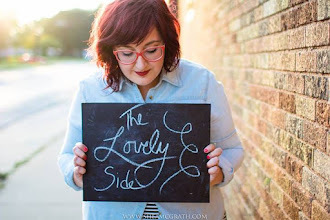 loving your blog, jessica. i dont know where you find your pics but honestly after looking at several sites for inspiration, your blog is the best hands down. as for this post....i was like, " wooo, i like this room. gonna be inspired by it.." until the desk pics came up. LOL. total chaos. reminds me of my room now which i am hoping to give a little TLC to. oh WOW. this is a new feature i hadn't seen, being MIA for almost a year. what a wonderful post! Could you please tell me where I can get a desk like Spencer's? Where can you buy that chair? seem to find one online. Thanks. Oh! I love Spencer’s room! I think I’m gonna do the same thing on my new apartment for rent salcedo village. I'd definitely donate to this superb blog! I suppose for now i'll settle for bookmarking and adding your RSS feed to my Google account. rest of the site is also high quality. Have a fun. This is so cool, Spencer is my favorite character from Pretty Little Liars, and i am so doing this to my room! Where can I get the huge fabric inspiration board?or is there a way I can DIY it? wow! realy nice post. nice bed. Love the final result. Thanks for the inspiration and the tips.